Contributors from several countries discuss the central moral issues arising in the emerging global order: the responsibilities of the strongest societies, moral priorities for the next decades, and the role of intellectuals in view of the huge gap between widely expressed moral ambitions and prevailing political and economic realities. Thomas W. Pogge is Associate Professor of Philosophy at Columbia University and at Oslo University. The author of Realizing Rawls, he also works on Kant and issues of international justice. 1.Thomas W. Pogge: Introduction: Global Justice. 2. 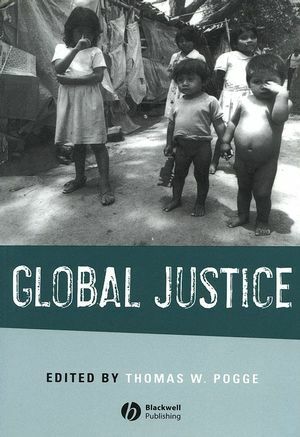 Thomas W. Pogge: Priorities of Global Justice. 3. Rüdiger Bittner: Morality and World Hunger. 4. Andrew Hurrell: Global Inequality and International Institutions. 5. Wilfried Hinsch: Global Distributive Justice. 6. Lief Wenar: Contractualism and Global Economic Justice. 7. Stéphane Chauvier: Justice and Nakedness. 8. Charles R. Beitz: Does Global Inequality Matter?. 9. Simon Caney: Cosmopolitan Justice and Equalizing Opportunities. 10. Stefan Gosepath: The Global Scope of Justice. 11. Rainer Forst: Towards a Critical Theory of Transnational Justice. 12. Onora O’Neill: Agents of Justice. 13. Véronique Zanetti: Global Justice: Is Interventionism Desirable?. 14. Michael W. Doyle: The New Interventionism. 15. Andreas Føllesdal: Federal Inequality Among Equals: A Contractualist Defense. Includes contributions from both internationally renowned experts, and younger scholars offering fresh perspectives. Considers many moral issues never before approached. Integrates normative with empirical and explanatory views.